Smoothies are the perfect breakfast solution if you don’t have time in the morning for a sit-down meal. Smoothie bowls, on the other hand, are a yummy twist on your usual breakfast drink and come in a variety of combinations. This month, set aside a few extra minutes in the morning and enjoy a smoothie bowl recipe. What is a smoothie bowl? It is typically a smoothie too thick to be enjoyed with a straw, so you have to eat it with a bowl and a spoon. Other ingredients such as whole berries, seeds, or granola are added for crunch and extra nutrients. Smoothie bowls are like the colorful, adult version of cereal and milk. Listed below are a few smoothie bowl recipes to try. Are you a big fan of Cocoa puffs, Cocoa Pebbles, and other chocolate cereals? If so, consider making a chocolate peanut butter smoothie bowl. This Garnish & Glaze recipe is made by blending vanilla Greek yogurt, a banana, peanut butter, cocoa powder, and ice. Top your smoothie with sliced bananas, finely chopped chocolate, granola, and peanut butter. The final product is a delicious, protein-packed breakfast. Did you know that each of the different colored Froot Loops has the same fruit blend flavor? This fruit-blend smoothie bowl captures that diverse fruity flavor. This recipe from Lucy Parissi calls for blueberries, raspberries, blackcurrants, blackberries, coconut milk, gluten-free oats, agave syrup, almond butter, and chia seeds. The smoothie is then topped with pumpkin seeds, walnuts, raspberries, and dried cherries and goji berries. It’s a beautiful, and healthy breakfast. When you were growing up, were you a fan of Apple Jacks, Apple Cinnamon Cheerios, or Apple Cinnamon Chex? You can achieve that apple and spice flavor with this smoothie bowl recipe from Brandon Matzek. This smoothie bowl is made with old-fashioned oats, sweetened almond milk, plain Greek yogurt, maple syrup, cinnamon, vanilla extract, ground turmeric, an apple, a date, lemon juice, kosher salt, and ice cubes. The smoothie is topped with pumpkin seeds, sunflower seeds, coconut, chopped apple, and maple syrup. It’s a yummy way to start your day! 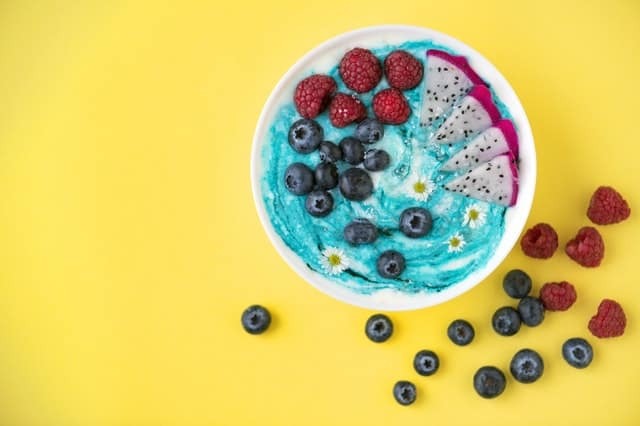 To add some colorful fun to your breakfast routine, try this recipe for Funfetti No Cake Protein Smoothie Bowl from a Whisk and Two Wands. This recipe calls for coconut milk, coconut flour, chickpeas, a banana, almond extract, vanilla protein, maca powder, sprinkles, and some Vanilla Macaroons from Hail Merry. With this recipe, you’ll feel like you’re eating dessert for breakfast!